Got some human hair extensions, weaves a lace wig or a lace closure that's looking a little … meh? Revive them with a bleach bath!! I've always bought human hair extensions but after a while no matter how well I've looked after them they can go a little....busted. In the past I've either chucked them away if they've been really bad or revived them by using a good clarifying shampoo & a deep condition. But recently I took the plunge & did a bleach bath on some of my old hair extensions that I was reluctant to say goodbye to. Doing a bleach bath on hair extensions or lace wigs is not a new thing. Hair professionals have been doing this for years but its not a method to be taken lightly as you could damage your extensions if you don't do it properly. I would suggest if you’re at all worried about doing this on your human hair extensions then either do a test piece or just buy new hair. The steps itself are relatively easy..... almost a bit too easy. When you’re doing it, it feels wrong as its sooooo easy but the results themselves are amazing. Unfortunately I did not take pictures of before & after the hair extensions used are for demo purposes only. Human Hair Extensions - only!! 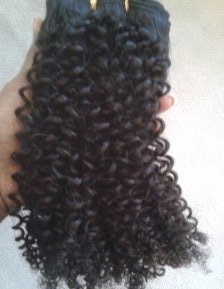 Comb out all tangles or knots from hair extensions/lace wig unit BEFOREHAND. If using clip on hair extensions then tie hair in bundles with a hair band. Boil kettle or use hot, hot water from the tap. 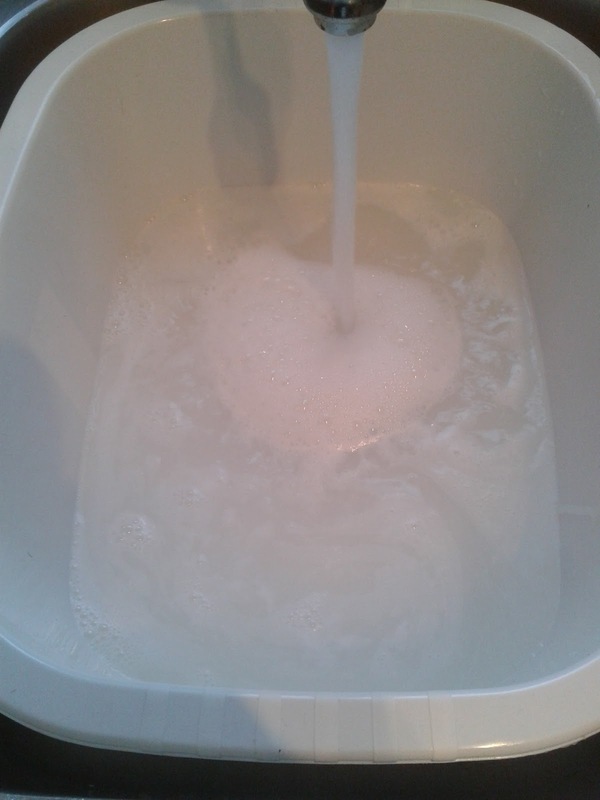 Add water to the sink & add the bleach (give it a good stir). 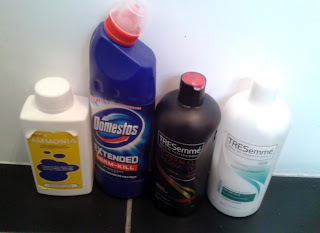 Pour water into the bowl and squeeze shampoo & conditioner into water & stir to blend. Dip hair in bleach bath water until fully submerged. Comb through hair if you can in a downwards motion away from your face & leave hair in bleach bath a maximum of 3 minutes in total. 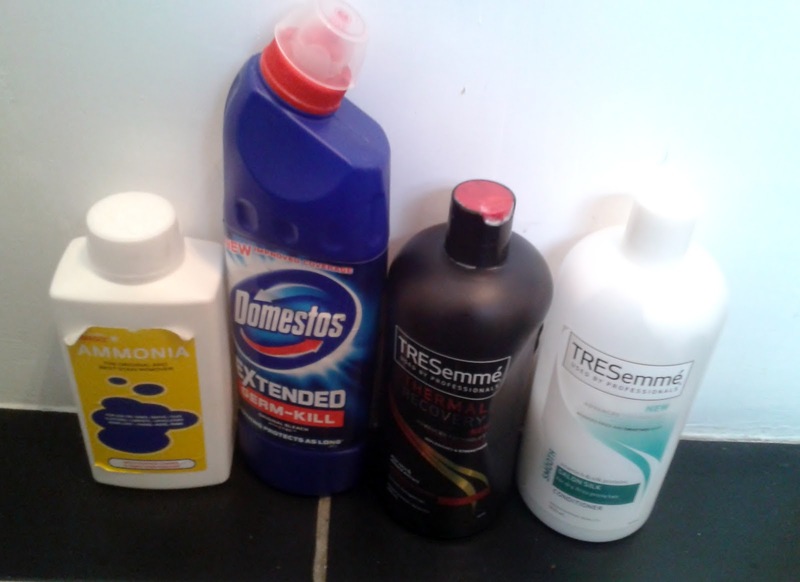 Take hair out of bleach bath, gently blot out excess liquid & immerse in the shampoo & conditioner water & comb gently. Leave hair in water whilst you set up Step 3. Empty & rinse out sink. Measure hot water into sink add Ammonia to water & gently stir. Take hair out of shampoo & conditioner mix, blot excess liquid & dip in & out of the ammonia water mix – combing through the weft in a downward motion for a max of 2 minutes. 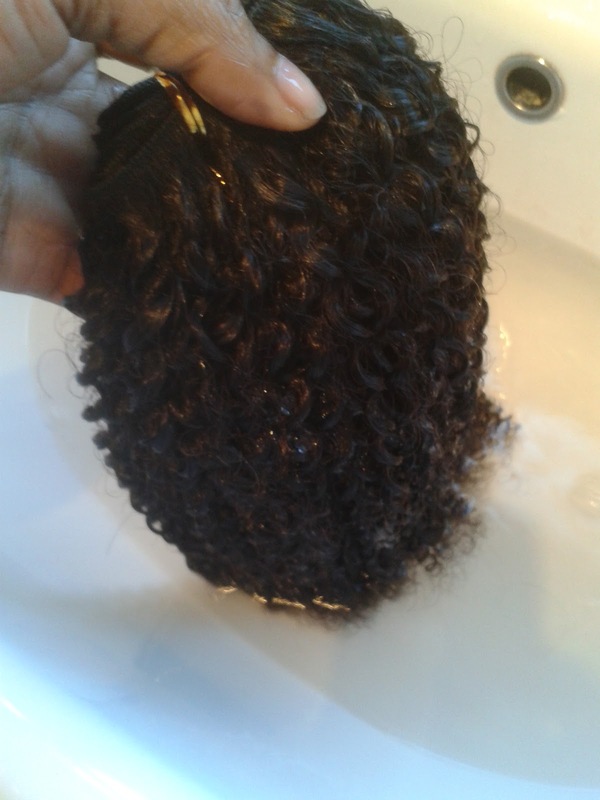 Squeeze out excess water gently & blot the hair. Place wefts/wig back into shampoo/conditioner mix. Take wefts/wig out of shampoo conditioner mix, squeeze off excess water and then lather in a nice thick creamy conditioner. Place wefts in a freezer bag/carrier bag & nuke in microwave for 30 seconds. IF YOUR WEFTS STILL HAVE CLIPS ON THEM THEN DON’T PLACE IN MICROWAVE!! LEAVE EXTENSIONS IN BAG ON WRAP IN A TOWEL OR PLACE ON A WARM WINDOW SILL. Leave the extensions to cool down & then thoroughly rinse the wefts to remove conditioner. If your rinsing out a lace wig/closure make sure that you give the lace a good rinse. Blot extensions & air dry. Oooh la la fabulous new looking hair extensions!! Yaaaay! Still not certain how it works? Here's a YouTube demo!! This is a really helpful post! And will definitely come in handy! Really interesting post, I just might try it.haha. Oh my God, I never thought you could do this, but then why wouldnt you (doh!) you can bleach normal hair!! I dont use extensions but I am going to share this with my friends who do and see if they do this already or not. Your steps are really clear and good! Glad you found it handy. Yes, I have dyed remi hair extensions before all you need to do is buy a box colour and keep a eye on the amount of time it takes for the colour to develop. Sometimes the colour can come out darker because of previous treatments to the hair so keep a close eye on the hair whilst its dyeing. I haven't heard of doing this, although it sounds very interesting. I've worn hair extensions for about 9 years now and it is nice to know I can save them rather than bin them! Thanks Aimie, I swung by your blog. Its super cute, I had to remind myself to get back to blogging!! Glad you found the post helpful. Its well worth the little bit of effort to keep them longer. Only do this when they start to play up! Or if you think they will start to tangle! Hello, does this work on chemically dyed hair extensions? 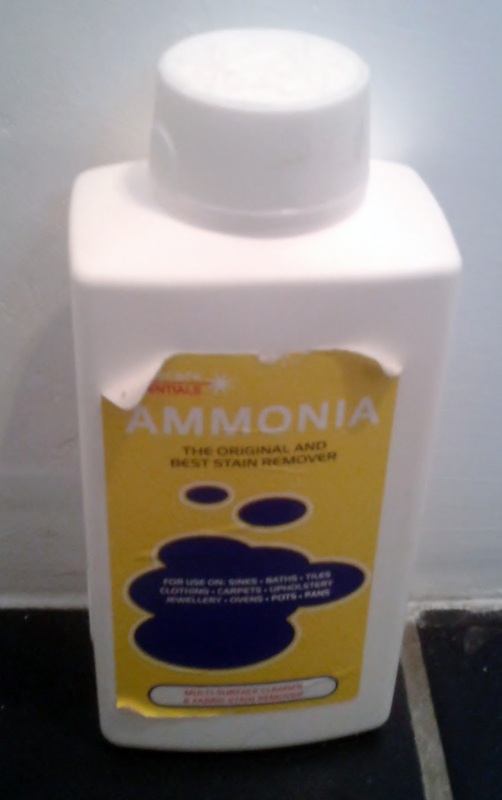 And what if you skip the ammonia part? Thank you! Hi, Sorry for the late reply this accidentally went to my spam box. I would recommend only testing one piece first to make sure that the hair did not get destroyed and do not skip the ammonia part. I ordered mine off Amazon for under a £5 and you can pick it up from stores like B & Q etc. 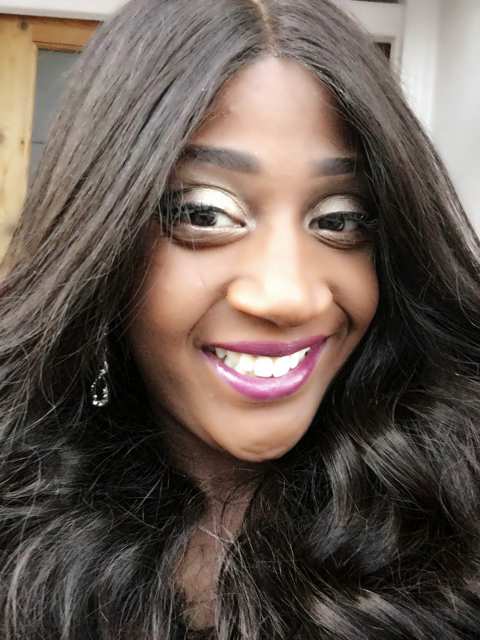 Hair extensions are fast becoming one of the most popular ways of changing your look and it is most important to know how to care it. I read your post twice and i think it has great tips for that.Thanks for it.